I found a Bushnell Pacifica Xtreme 8x42 roof binocular on clearance, couldn't pass it up. Good eye relief that I need for glasses with astigmatism correction, waterproof, and so inexpensive I won't be too upset when I break them doing something xtreme in Pacifica. The spec'ed exit pupil on the box is 4.72mm. 42mm/8=5.25mm. What can I infer about the fact that the exit pupil is 10% smaller than objective/magnification? Does this binocular function as a 8x38, or a 8.9x42? You could always measure the exit pupil directly with calipers/ruler while pointing them at a light-colored, brightly-lit wall. If they are measured at 4.72 mm, I wonder if that could be caused by masking off the prisms? I honestly don't know, but others on the forum may chime in. It could go either way, or somewhere in between. The only way to know for sure what you have is to first measure the effective aperture of the bino with the "flashlight test". Once you have the true aperture, divide it by the measured exit pupil diameter and you'll have the actual magnification and aperture. 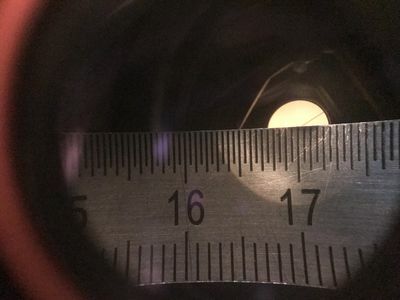 You can best find the exit pupil diameter with a caliper that has a piece of frosted tape stuck onto the back of one jaw; position the tape away from the eyepiece at the distance where it shows the smallest, most focused circle of light (the exit pupil distance) and then measure. Do you have a link for this product? I don't think it would be too difficult to make one yourself. All you need is an old eyepiece with diopter adjustment (focus) from a binocular and a millimetre grid acrylic ruler. And what I see through the eyepiece... of course it was a bit difficult to get everything lined up and hold the camera at the same time. These are military 8x40's (Huet Marine) and as you can see, the 5mm EP is correct. Edited by Mad Matt, 13 December 2018 - 05:27 AM. Yeah, could make one... I've done a lot of that. But such niceties often left on the to-do list for that time that never quite seems to come. It didn't cost much. Don't recall where I bought it, other than Astromart. It was possibly second hand? The one I have is 6.5-9.5 inches long (depending on where you set the back-focus conjugate to the mechanical interface) and further comprises a relay lens. 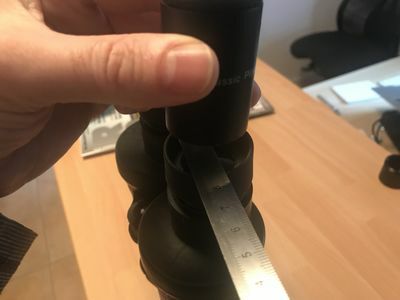 Its range is from approx 20mm outside the eyepiece mechanical top to 50mm inside (which feature is Great, something you can't measure with tissue paper). More out-range is available by swapping a different base or adding an extension. Very convenient! Edited by TOMDEY, 13 December 2018 - 06:33 AM. I think it much more likely that the aperture has been stopped down for some reason rather than the magnification is increased.